As soon as Amish Acres opened to the public in 1969, one of the first requests from inquisitive visitors was for a map of the countryside to extend their visit to Nappanee. Fortunately, we had produced a cartoon-like map to complement the Pletcher Village Arts & Crafts Festival since 1963. It was not only cartoon-like, but designed by Max Gwin, a well known cartoonist from Nappanee. Max is one of six nationally syndicated cartoonists to have grown up in Nappanee and shared the same art teacher. They rode the heyday of the newspaper cartoon strip culture. Merrill Blosser's "Freckles and His Friends," is the only comic strip in history to reach its Golden Anniversary under the personal direction of its original writer-cartoonist. Bill Holman's "Smokey Stover and the Smoke Eaters," remains the mascot of the Nappanee Fire Department. Fred Nehr created the popular and insightful strip "Life's Like That." Henry Maust, originally a cartoonist, switched to painting and commercial art and was published on a regular basis by the "Saturday Evening Post" and" Woman's Home Companion," and Francis Parks became editorial cartoonist for the San Francisco Call-Bulletin. Max published his "Slim and Spud" cartoon strip in The Prairie Farmer for over four decades before his retirement. I had the privilege of "working" for Max while I was in high school. My skills were limited to drawing the square panels with an ink drafting pen, the kind that very easily smeared under the straight edge of the architect's triangle. Back to the map - with the arrival of Amish Acres, Max expanded his freehand map into an elaborate and detailed map surrounding Nappanee with more emphasis on the countryside shops that visitors found quaint and unique. That map remains the underlying design of the new, full color rendition by Jeff Stillson. Jeff is my son-in-law and an accomplished graphic artist who has been producing the farm's advertising material for over two decades and has become a well known artist in his own right through his Stillson Studio of Advertising and Design. The "new" map now includes exactly 100 points and places of interest. Since Amish Acres beginnings Amish owned cabinet, retail and sewing shops have proliferated and a total of 250 such establishments have been identified. The "new" map now includes the Elkhart County Heritage Trail, the Road Scholar Bicycle Trail, the Ren Town Trail, the Nappanee Bicycle Path, and Countryside Shoppes Trail. To emphasize the other world experience that visitors have come to expect, the map's cover is designed around passport stamps that represent all of the attractions of Amish Acres. A $99 Getaway Package has become the most popular way to take advantage of all that Amish Acres and Nappanee have to offer and the map is a centerpiece of the package. 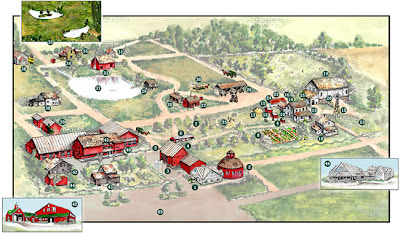 Although much of the original map remains unchanged, it has seen the addition of not only Amish Acres that is now listed in the National Register of Historic Places, but The Inn at Amish Acres, The Nappanee Inn, a Federal Wetland Nature Reserve, The Nappanee Center, the restored B&O Depot, the restorations of the downtown's historic murals, new streetscape, and the expansion of those early arts and craft festivals into one of America's premier events of its kind, having been ranked as high as the third best traditional crafts festival in the nation. Now Amish Acres also plays host to WFRN's Friend Fest, the fastest growing Christian Music Festival in America. The colorful little map has seen businesses come and go, the city nearly double in population, schools consolidate, parks and library expand to include a municipal golf course and airport. But the essence of the Amish society’s influence on the community's lifestyle, values, and craftsmanship remains prevalent and growing alongside Nappanee, the city. Now a new little map guides you through a delightful piece of small town and rural Americana.